Embed "Dr. Pollard's Message to Students #8" on your page. Episode 6 Copied From "Dr. Pollard's Messages to the Faculty & Staff"
Embed "Episode 6 Copied From "Dr. Pollard's Messages to the Faculty & Staff"" on your page. Embed "Dr. Pollard's Message to Students #5" on your page. Embed "Dr. Pollard's Message to Students #4" on your page. Embed "Dr. Pollard's Message to Students #3" on your page. 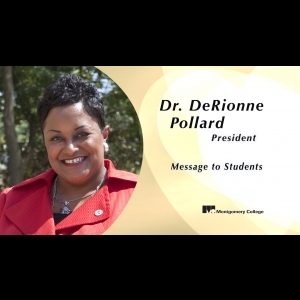 Video message from the president of Montgomery College to the student community. Embed "Dr. Pollard's Messages to Students - Episode 2" on your page. Embed "Dr. Pollard's Messages to Students - Episode 1" on your page.